Darth Continent: Blackout, or Blackmail? 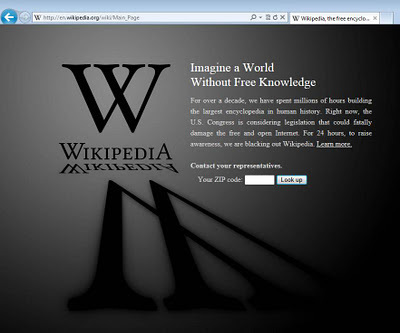 Today, Wikipedia joins a host of other sites participating in a protest against SOPA and PIPA, legislation which threatens to cripple the internet as we know it. 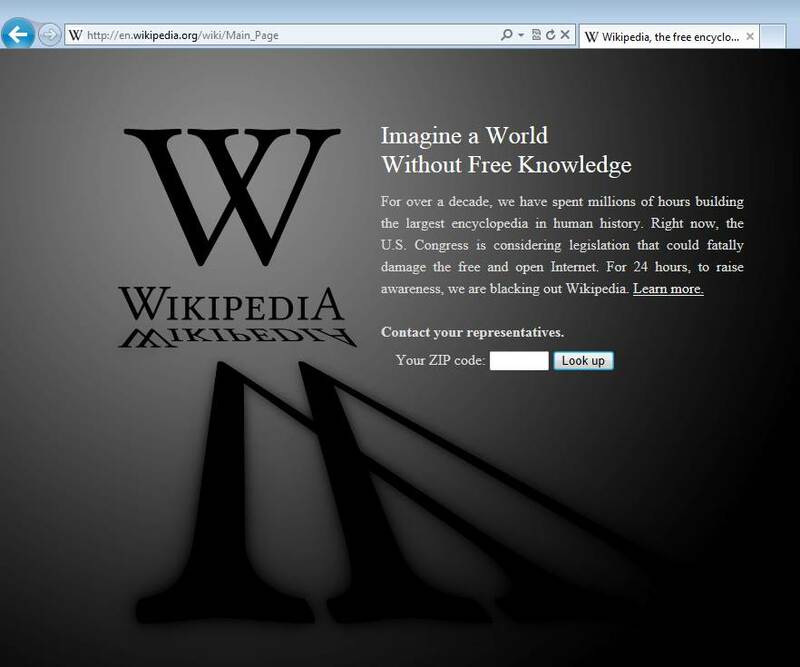 In solidarity with this movement, a "blackout" page appears when you try to view a given Wikipedia article. This is a token gesture at best, meant to prevent the majority of netizens from browsing their content. It's trivial to set up a rule in the Element HIding Helper for AdBlock Plus which prevents this banner from appearing in Firefox. 1. Tap the Alt key to view the menu in Firefox. 2. Click Tools => AdBlock Plus => Filter Preferences. As a longtime geek and software developer, it only took minutes for me to find a way around the blackout. It's easy to take for granted the ease of access we all have to vast stores of information on the web. My first reaction to the blackout made me think blackmail. Here we have Wikipedia essentially holding their information hostage, allowing a relatively small minority with the skills and wherewithal to work around the block, while the rest scrabble around looking for other sites with information they need, or... gasp... going outside and walking to the public library to interact with a real, living human being to do their research. For the duration of Wikipedia's blackout, there may be some who will suffer, albeit on the level of many relatively trivial first-world problems. Students scrambling to finish their research paper due later today will have to make do with various other sites that tell you about alternatives or help you work around the block. Someone looking up the etymology of mango for trivia with friends over lunch will have to look past the first or second search engine result. Yet, it is sobering to think how much people will suffer should SOPA in its initially proposed form pass. Freedom of information is core to the internet and fundamental to the continually evolving paradigm introduced by the information age. Clearly SOPA threatens that liquidity of information and, in fairly typical form, reveals how ignorant politicians succumb to the swansong of SOPA supporters trying the latest shotgun approach in a weak effort to combat theft of intellectual property. I'm happy to share information which will enable others to freely view Wikipedia despite the blackout, but in retrospect perhaps Wikipedia realized how easy it would be to work around the block, and get others at a similar place in life as myself to think for a moment about what it might be like for the rich Persian rug of information to be swept out from under our feet with the fall of a gavel in Congress.